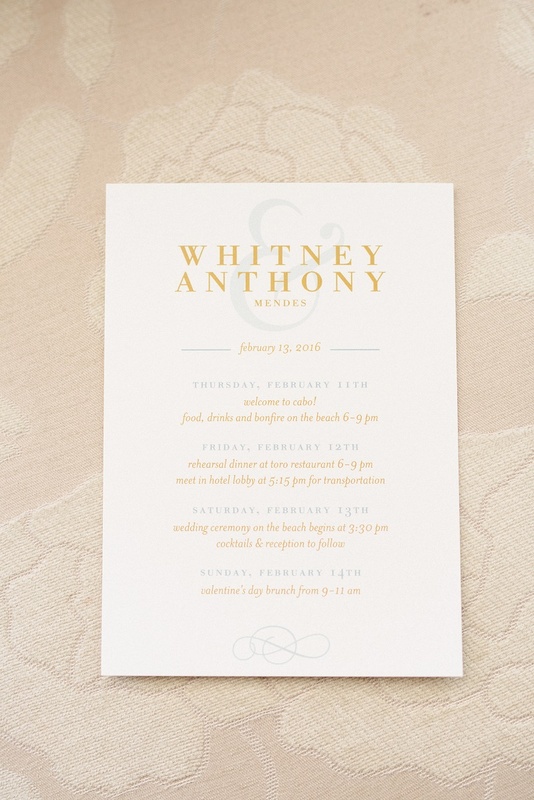 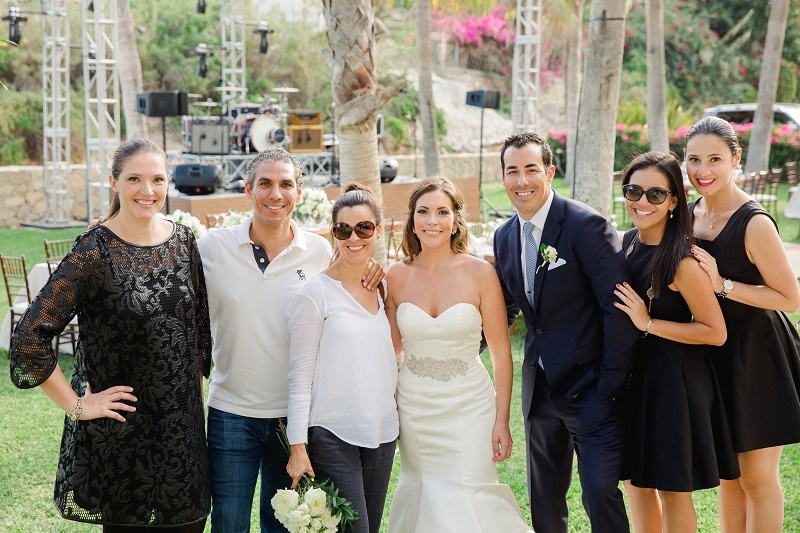 WHITNEY AND ANTHONY celebrated their Mexico wedding with a four-day event in Los Cabos for their friends and family. 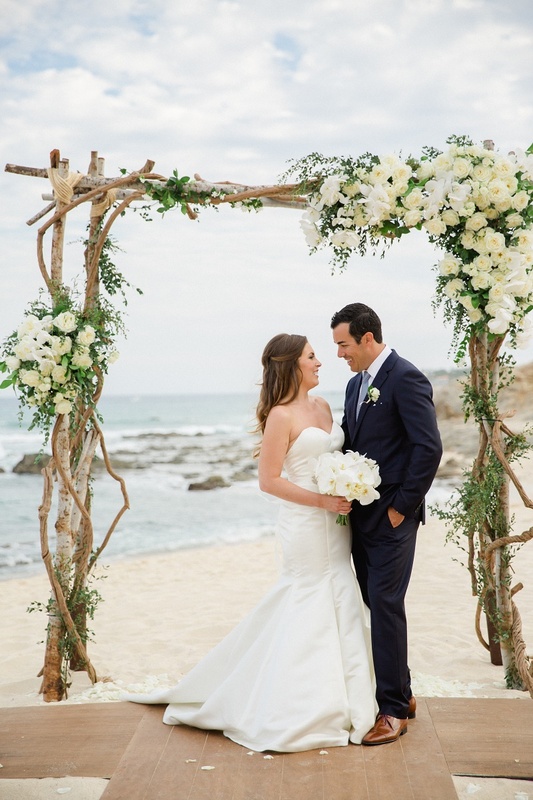 As luxury real estate brokers in San Diego, it’s not surprising that this stylish couple looked for, and ultimately found with the help of Claudia Morales, their amazing wedding planner from ELENA DAMY: Destination Weddings, their own private oasis for their Valentine’s Day wedding weekend. 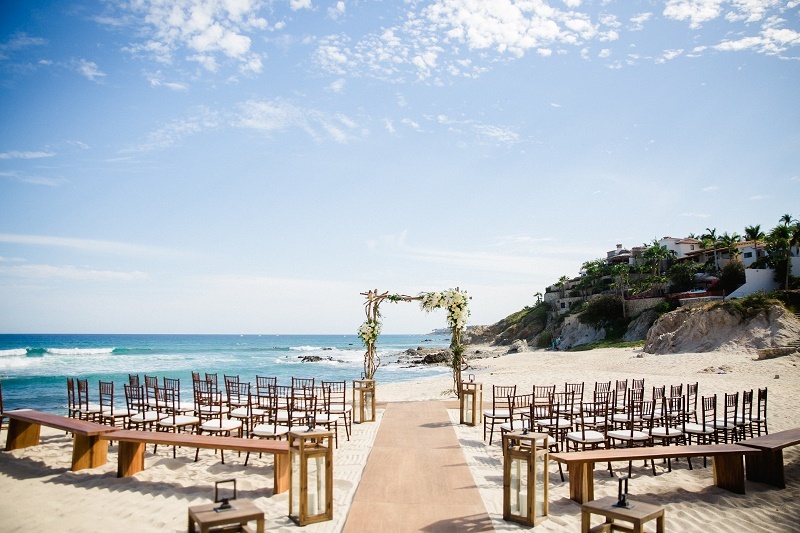 The Cabo Surf Hotel & Spa is a boutique beach resort located in an idyllic sea cove with a golden sandy beach well-known among serious surfers in Cabo. 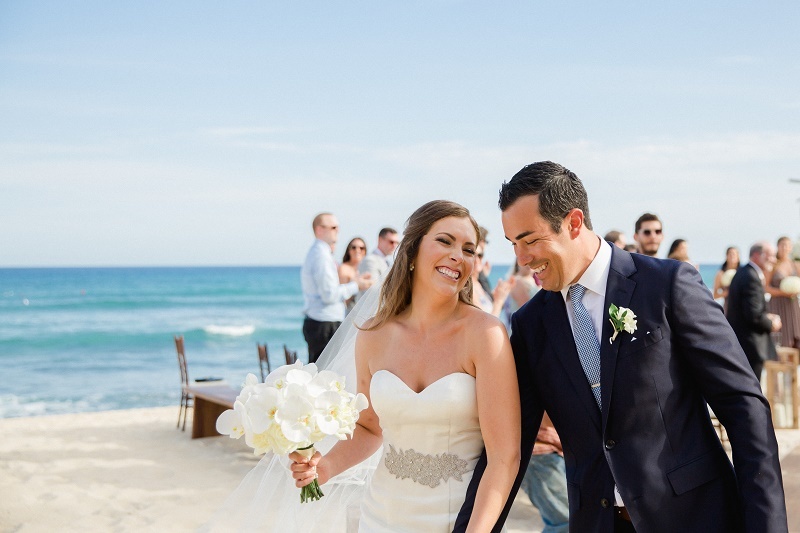 Warm and inviting, with a healthy dose of trend and taste, this Baja wedding was all about love on the beach in Los Cabos! 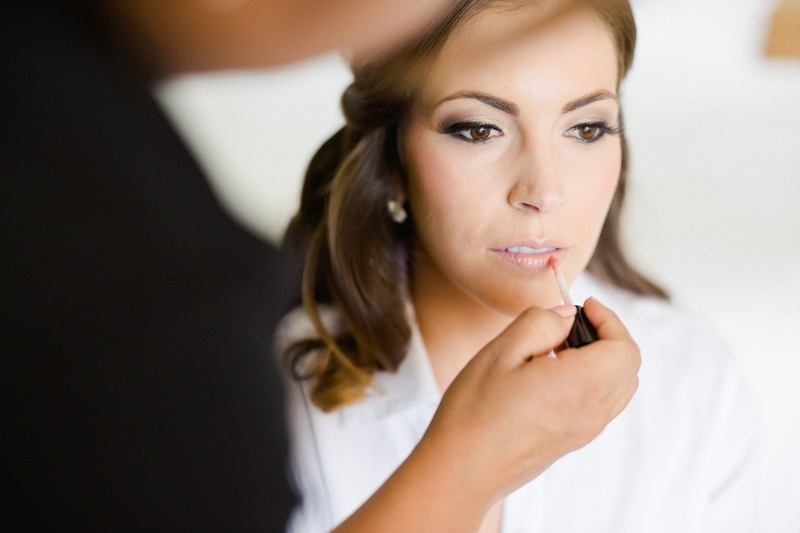 THE WEDDING DAY began with hair and makeup for Whitney and her bridesmaids. 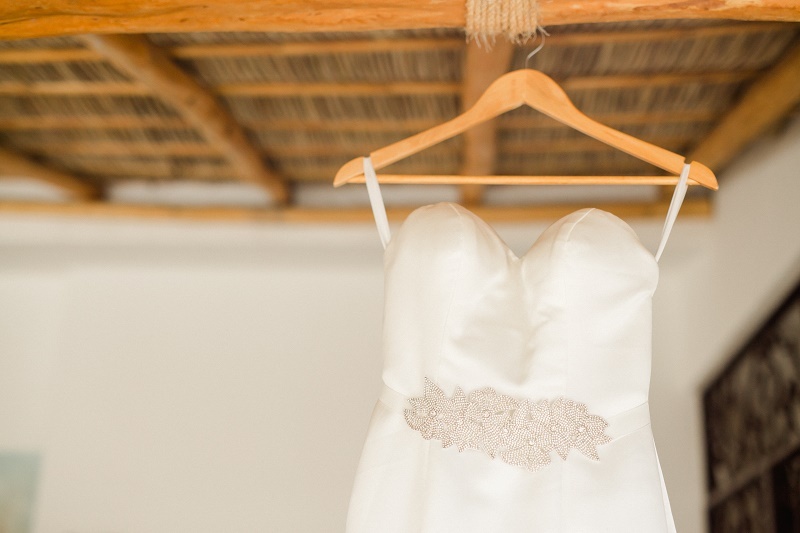 The gowns were truly lovely, and right on par with the whole design concept for the wedding: elegant, timeless, sophistication. 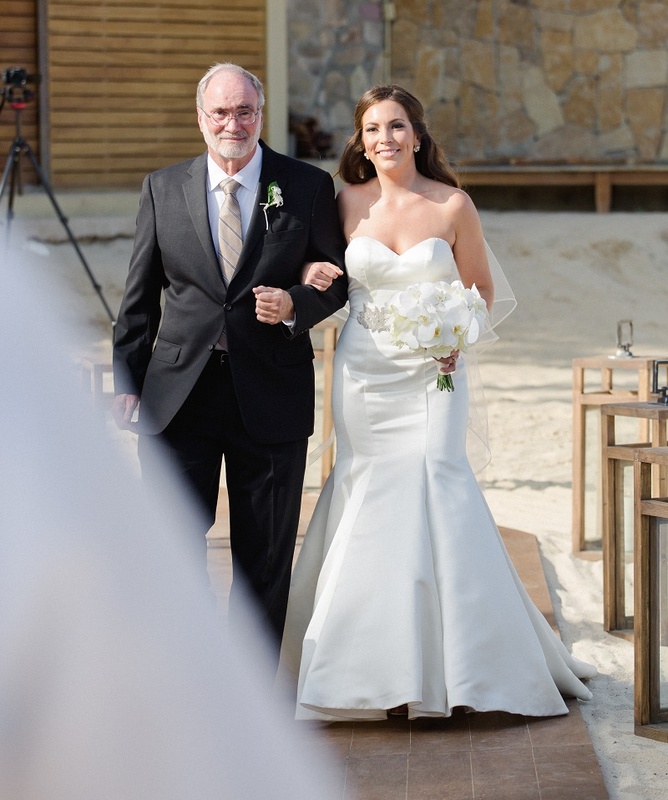 Whitney’s stunning strapless satin mermaid gown was selected from the Private Collection from The Bustle Del Mar. 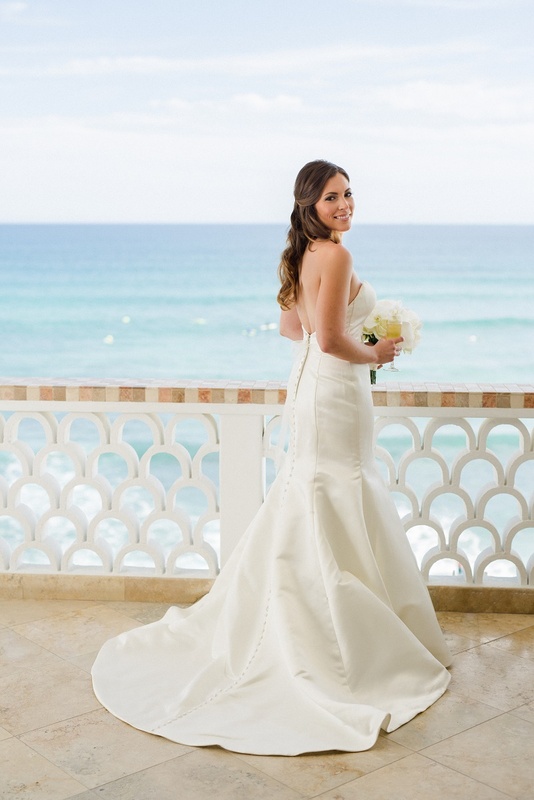 Perfectly fitted to Whitney, the gown was perfection by itself; however, adding the rhinestone flower sash from Elle & Jae made it sing! 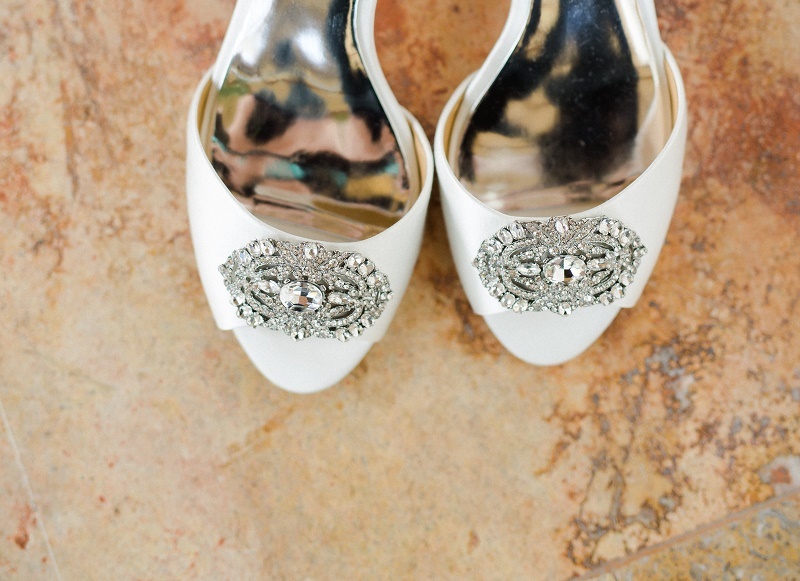 As did her sparkly, open-toed satin heels from Badgley Mischka. 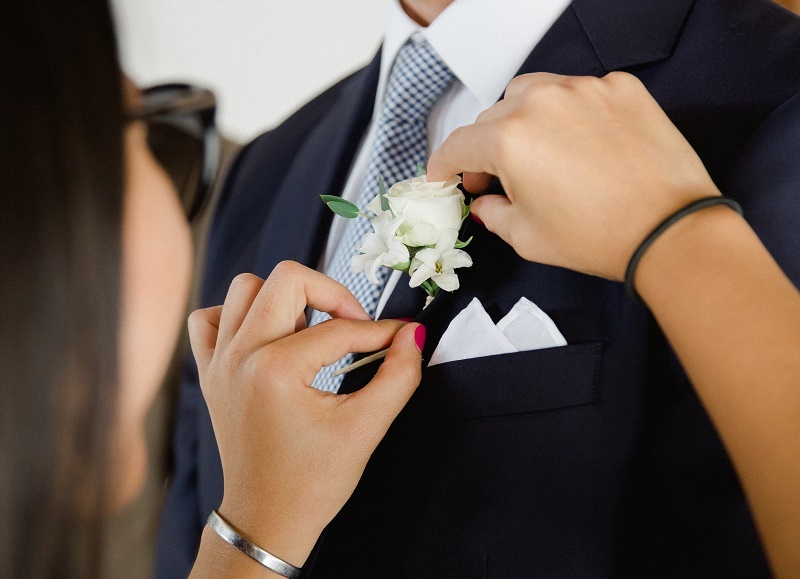 Accessory styling that added that little bit of glam without overdoing it! 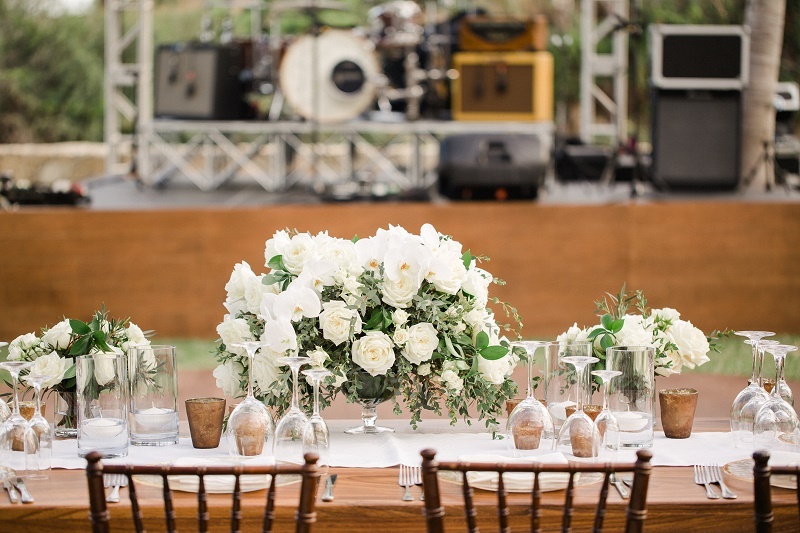 THE ENTIRE WEDDING CELEBRATION was a statement in California chic, with natural, muted tones of taupe, champagne and ivory blending with a modern rustic aesthetic created by Creative Director, Elena Damy. 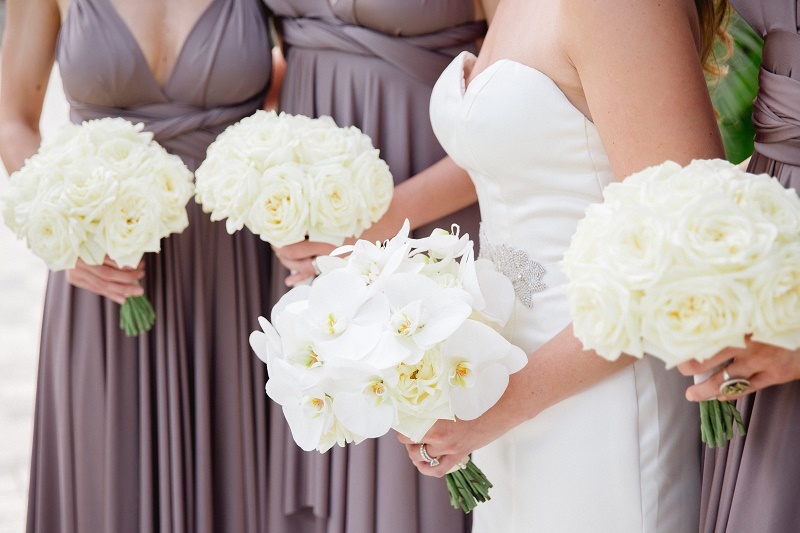 That design statement was introduced through elegant, monochromatic bouquets designed for Whitney and her bridesmaids. 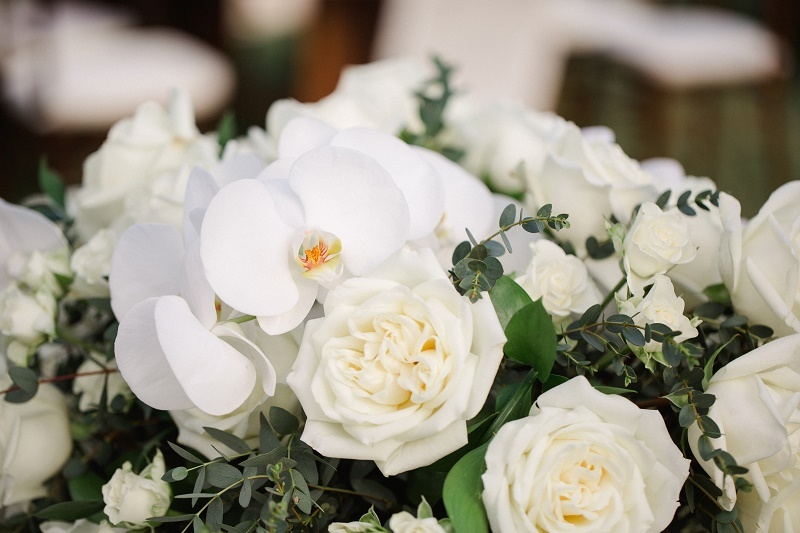 A mixture of white Phalaenopis Orchids and creamy Roses for the bride, and full-blown creamy Roses for her bridal attendants. 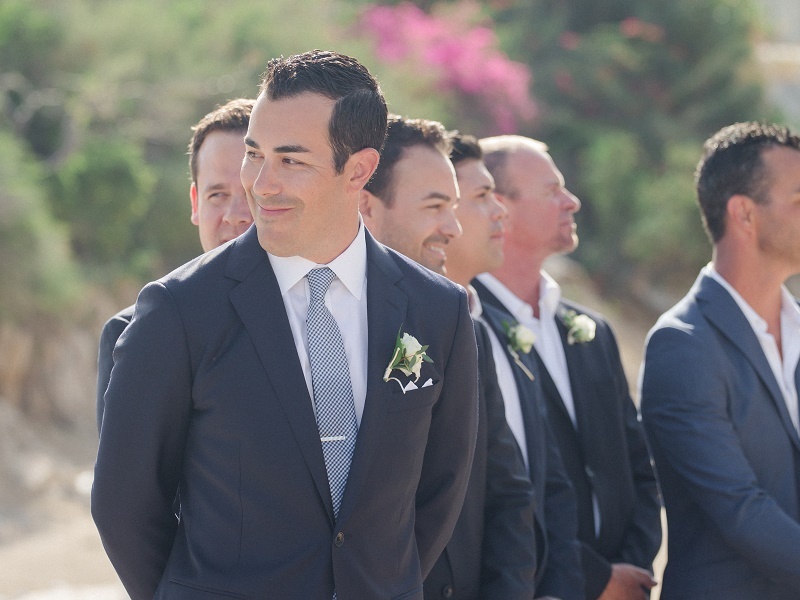 For Anthony and his groomsmen, only creamy white Rose and Freesia blossom boutonnieres would do for their picture-perfect navy suits! 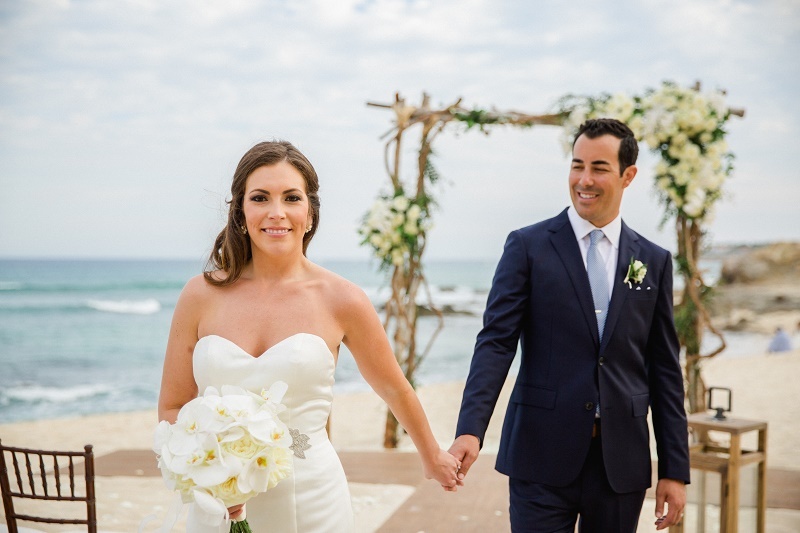 WITH ITS PRISTINE WHITE SANDY BEACH, the Cabo Surf Hotel offered an aqua blue beachfront location for the wedding ceremony! 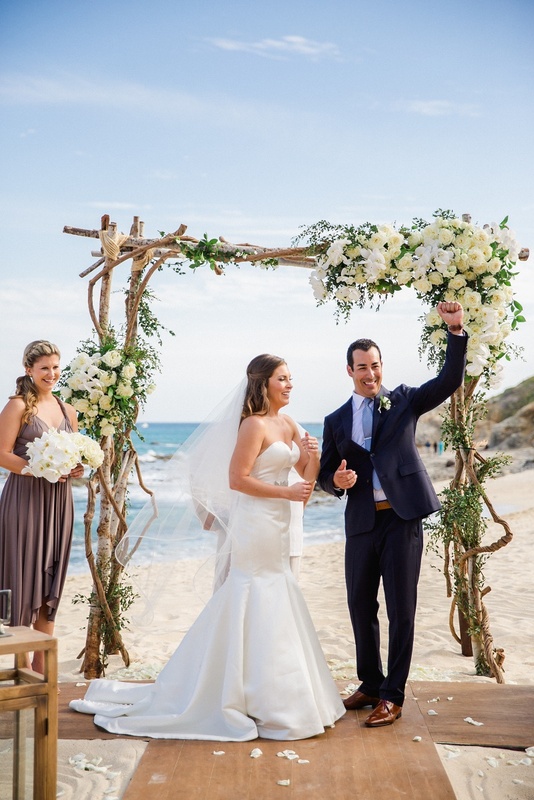 Elena designed a rustic floral arch as the ceremony focal point, and a mix of wooden benches and chivari reception chairs offered seating in the soft sand for guests. 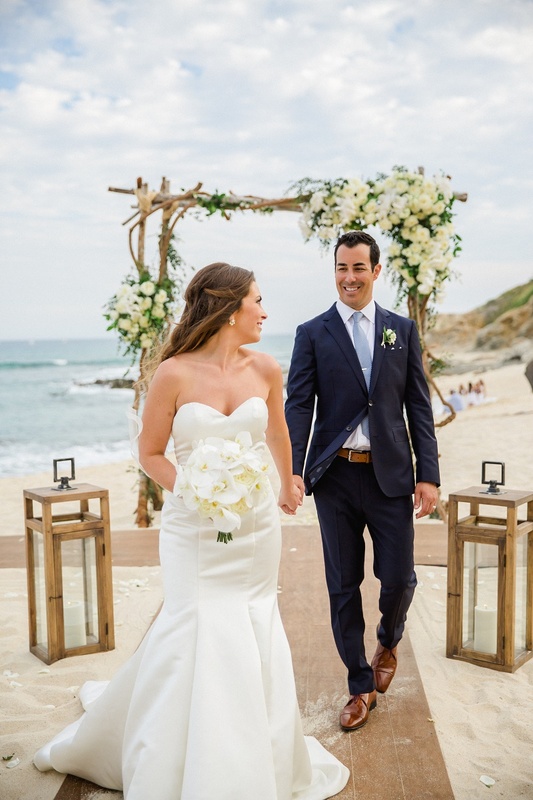 The ceremony aisle was floored with custom wooden planks and contemporary lanterns. 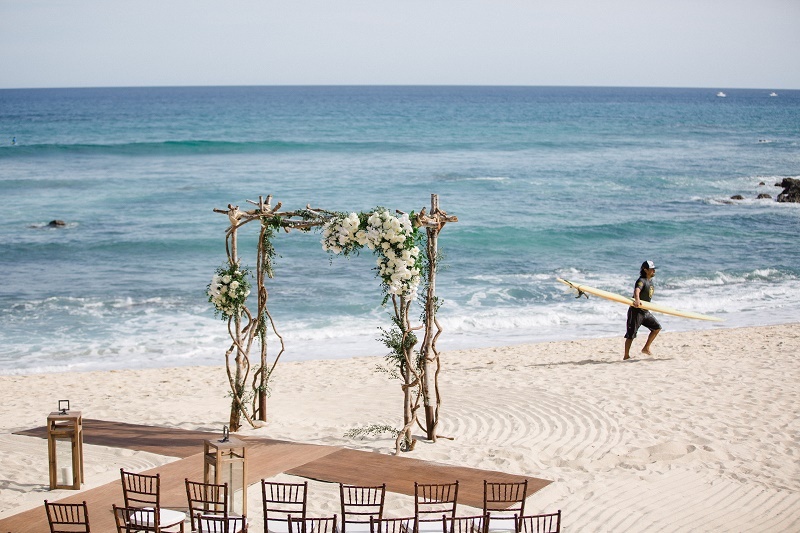 And, right on cue, just before the guests were invited to take their seats for the ceremony, a local surfer headed back in after a day on the waves. 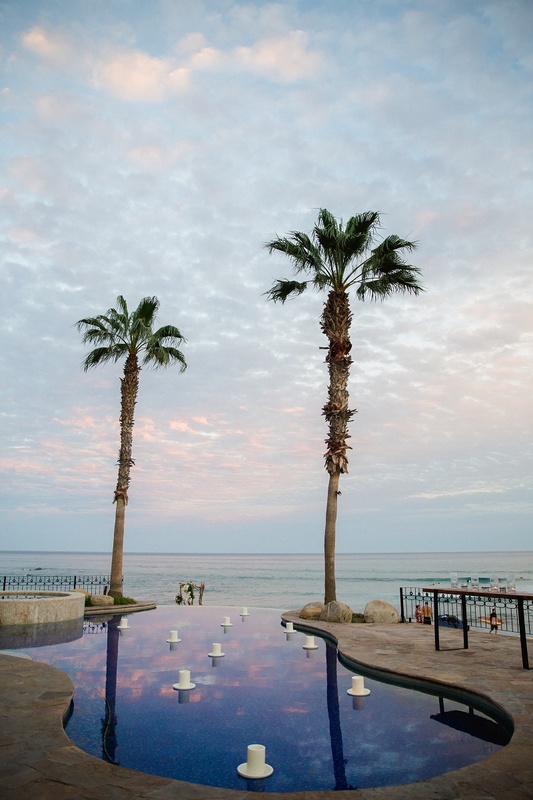 The ultimate Baja vibe! 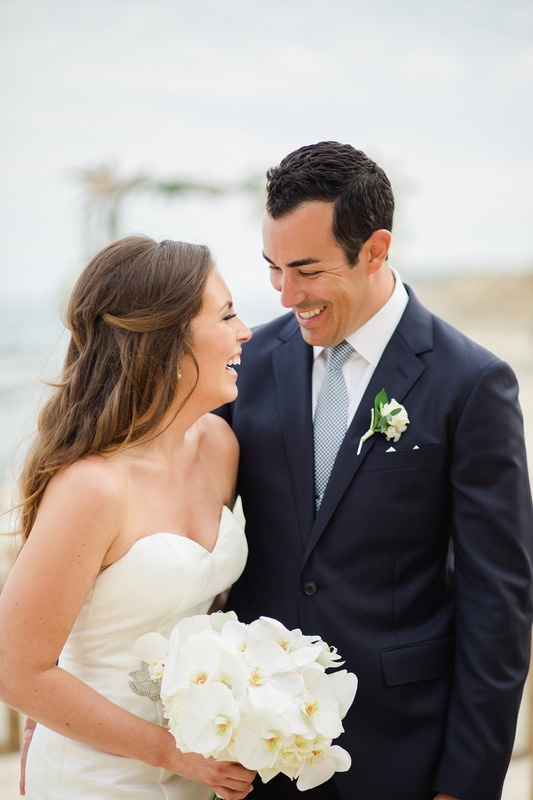 SMILES, SMILES, AND MORE SMILES! 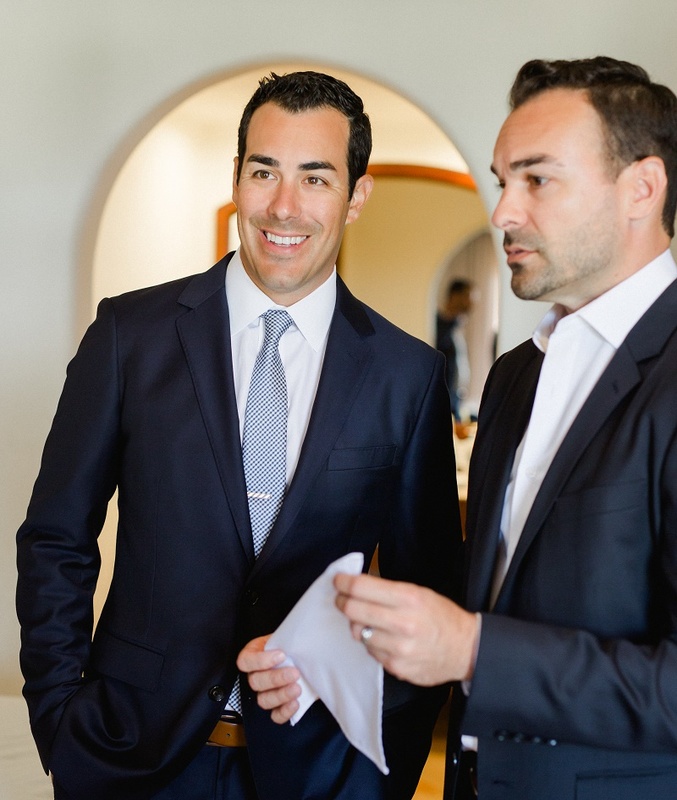 And can you blame them? 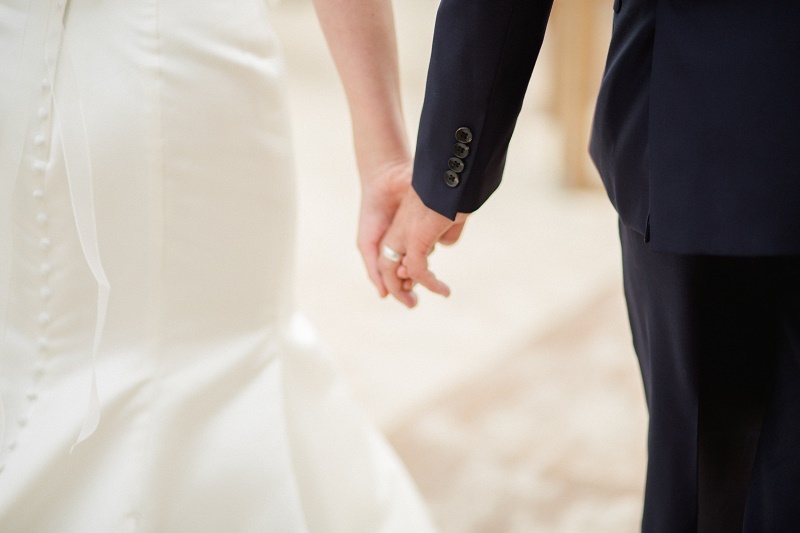 What a gorgeous day for a wedding! 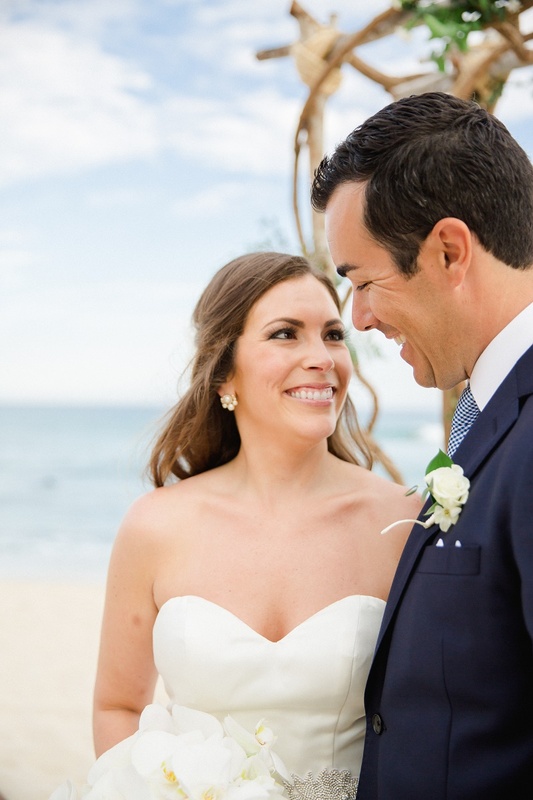 AFTER THE CEREMONY on the beach, Whitney and Anthony welcomed their wedding guests at the pool for cocktails before heading to the dinner dance reception. 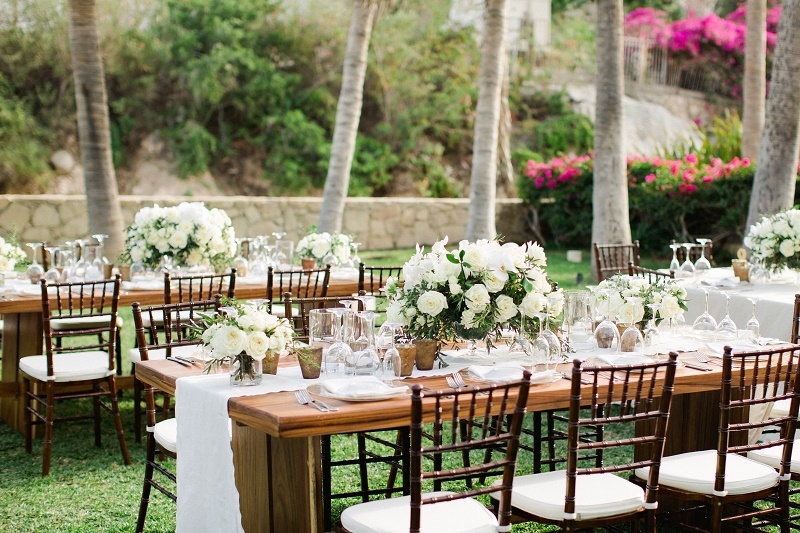 With this lovely scenery, just a few floating candles, wooden cocktail tables and modern glass hurricanes were needed. 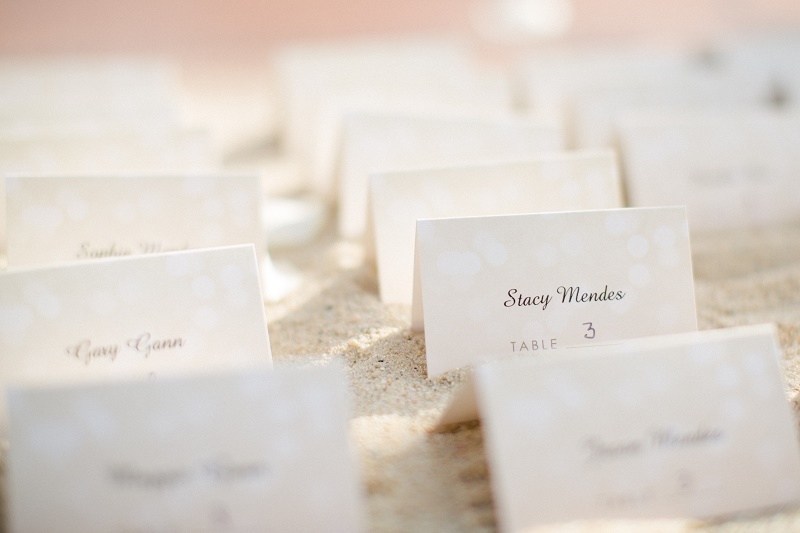 Tucked between floating candles and a collection of glass vases filled with flowers, the client’s classic placecards were lined up on a sand-covered wooden table. 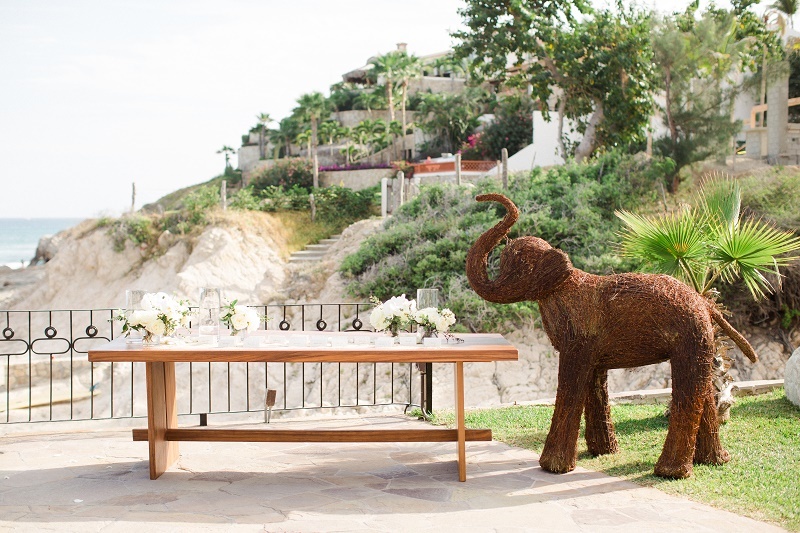 The hand-made elephant (created with sticks by an artist in Guanajuato) was requested for the groom as a surprise for the bride, because she loves elephants. 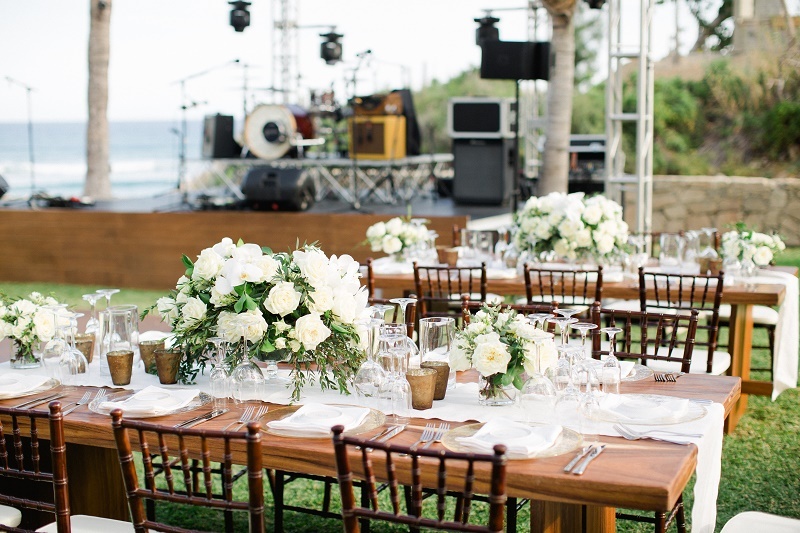 THE OPEN AIR DINNER DANCE TOOK PLACE ON THE LAWN OVERLOOKING THE COVE. 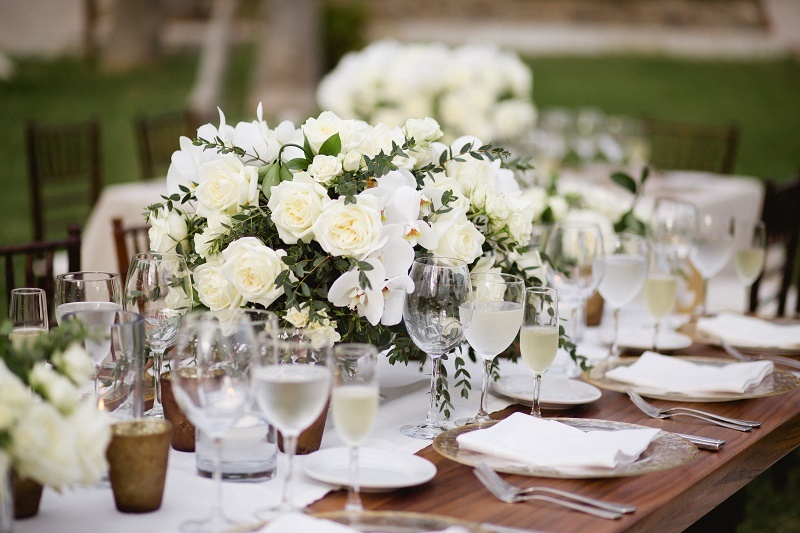 Rectangular wooden tables with natural linen runners and square tables with linen tablecloths were placed around a round wooden dance floor. 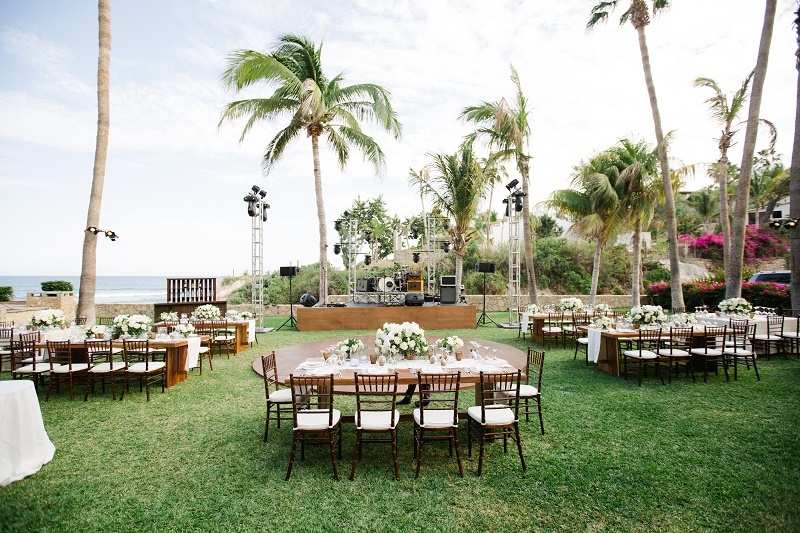 Under the palm trees we placed the stage for the band, and just to the side sat a wooden full-service dinner bar. 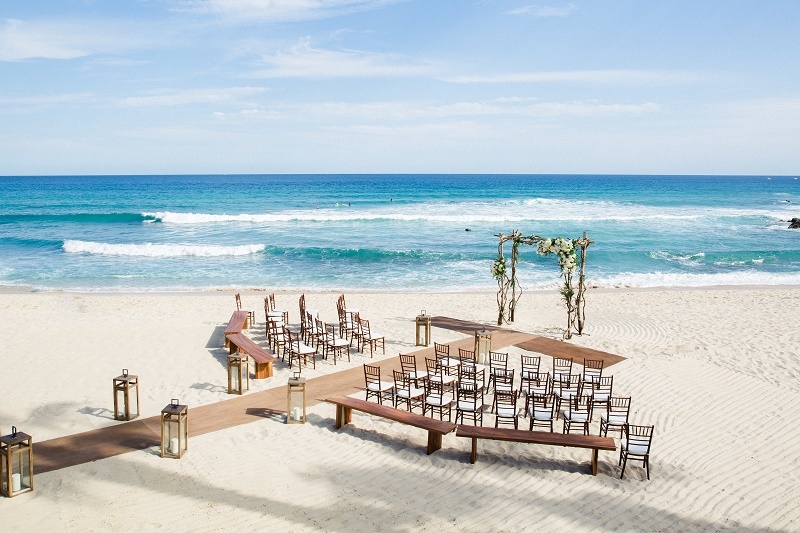 Dark wooden chivari reception chairs with ivory linen cushions completed the picture. 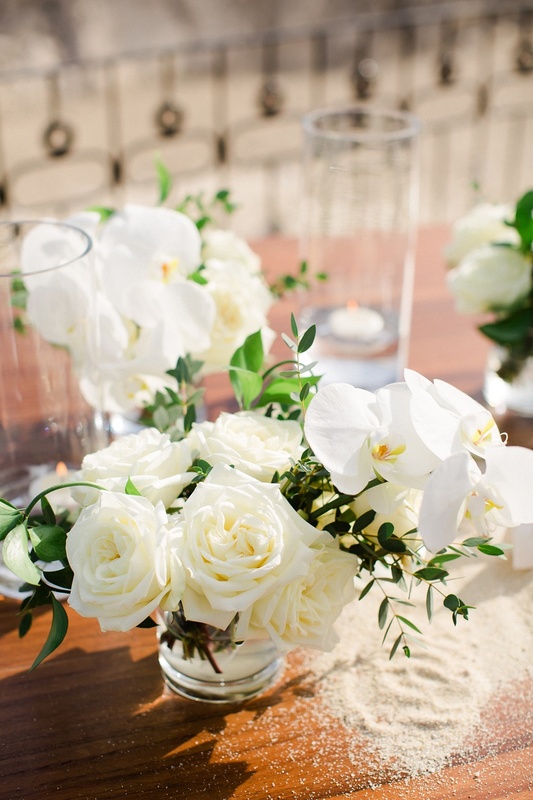 ELENA DESIGNED a mixture of low, lush floral arrangements for the table centerpieces using white Phalaenopsis Orchids, creamy Roses and delicate greenery. 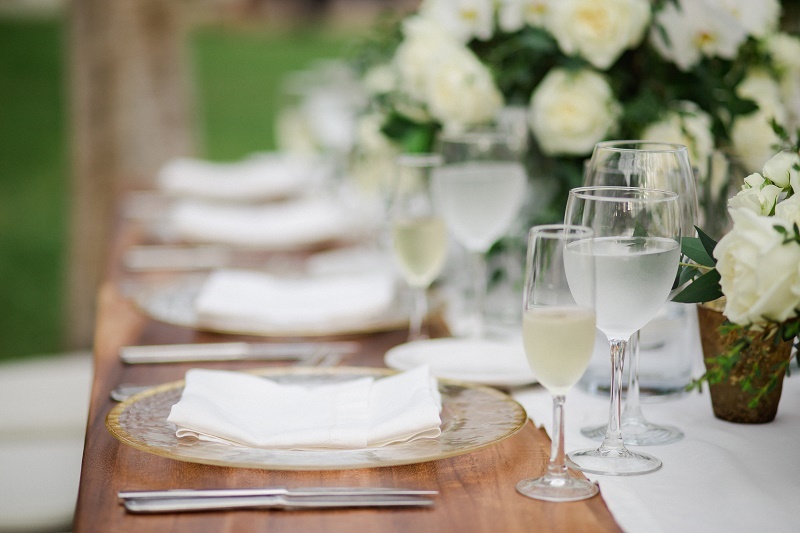 Clear glass vases and hurricanes added a lightness to the table top, as did the hammered glass chargers and clear stemware. 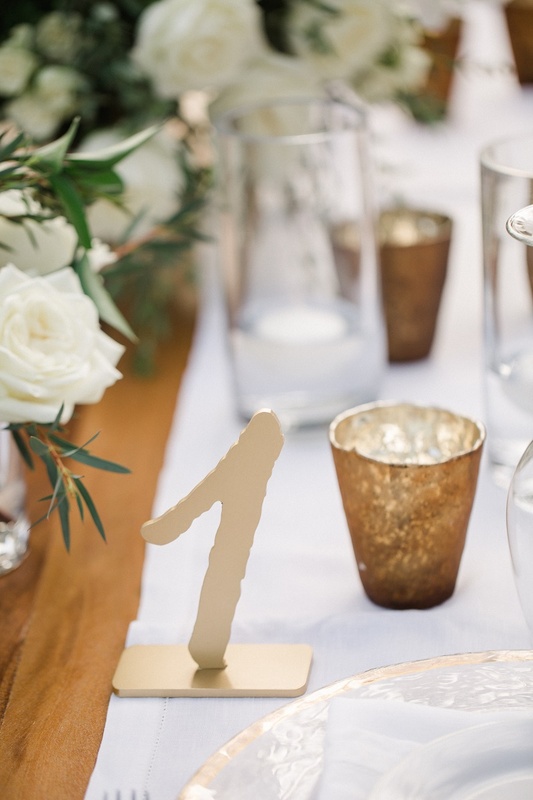 Modern metallic gold votive candles and brush gold table numbers added warm and texture to the tablescape. 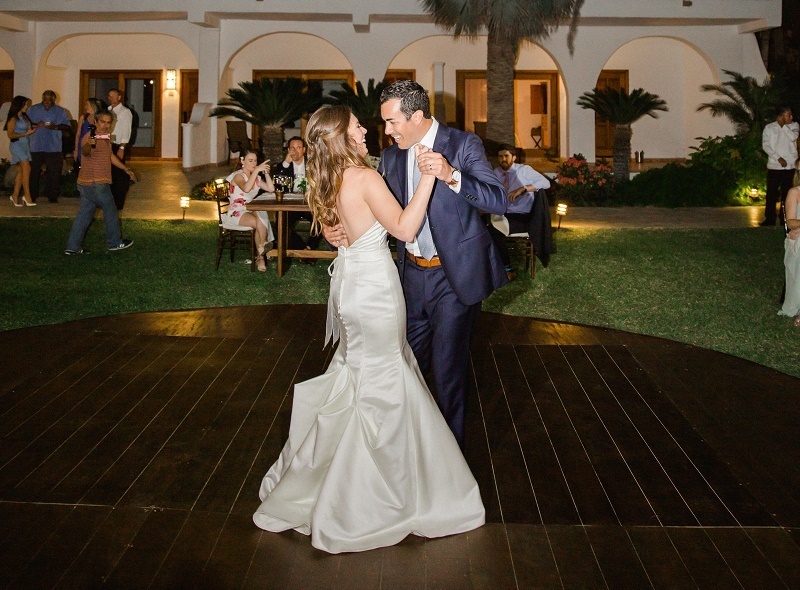 AFTER A DELICIOUS DINNER catered by the talented culinary team at the Cabo Surf Hotel, Whitney and Anthony got the dancing started with their first dance and parent dances. 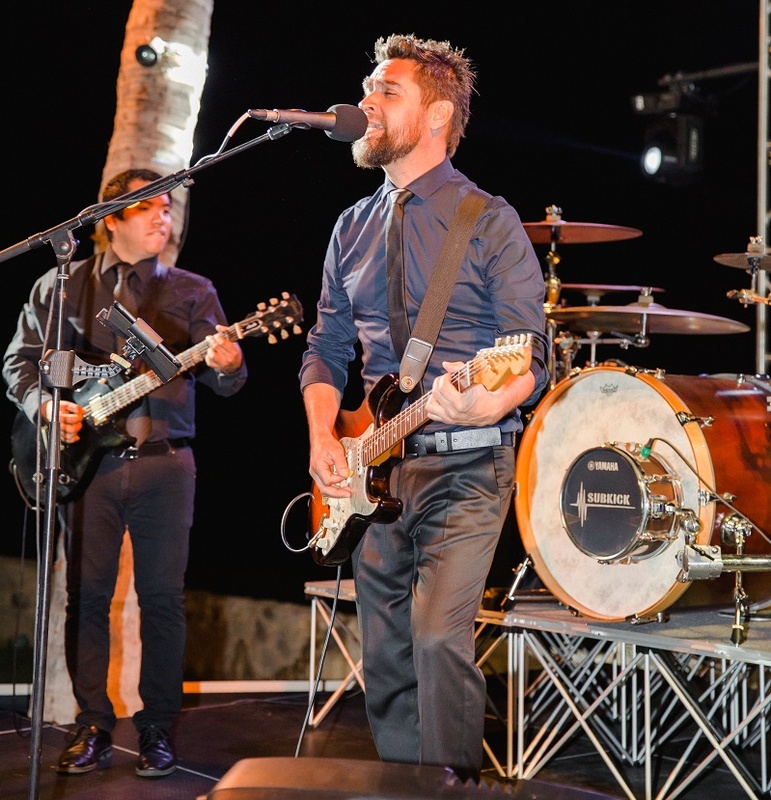 From there, it was all about the party! 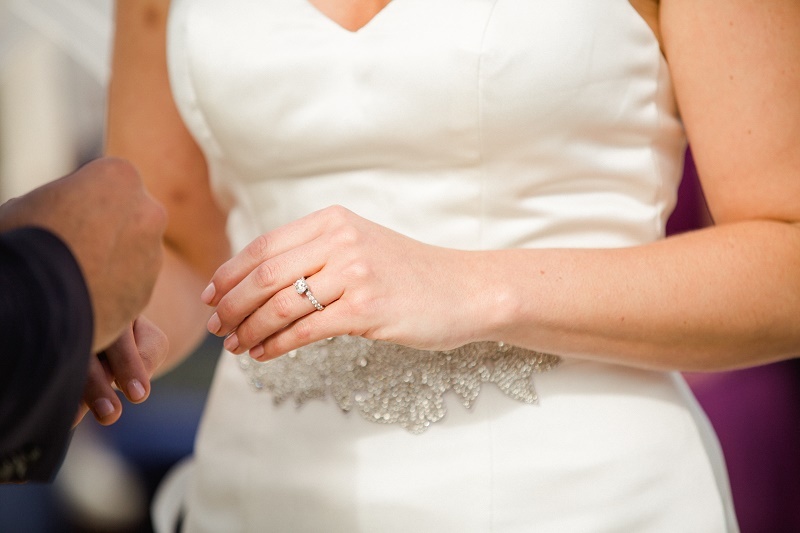 Oh, and the breathtaking fireworks show that came later after the cake cutting! 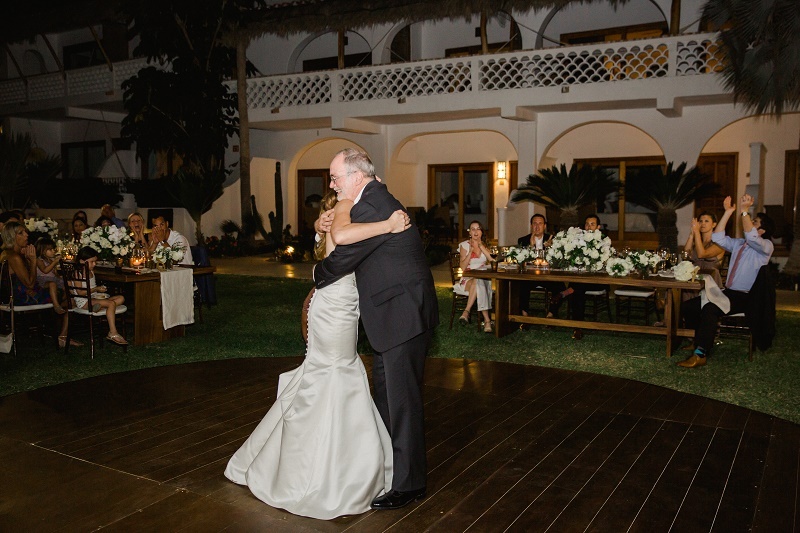 Once again, the entire Team Elena Damy congratulates Mr. and Mrs. Mendes on their wedding! 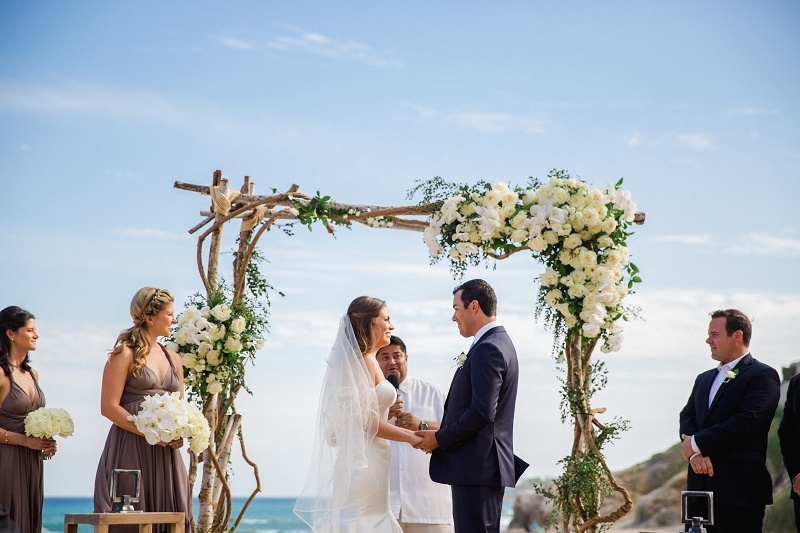 We thank them for trusting Elena Damy Destination Weddings to plan and design their dream Los Cabos wedding! 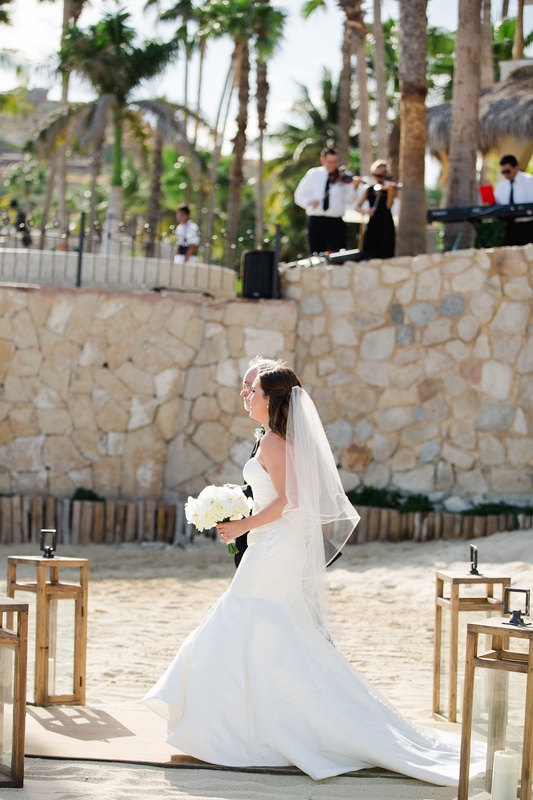 Love on the Beach in Los Cabos! 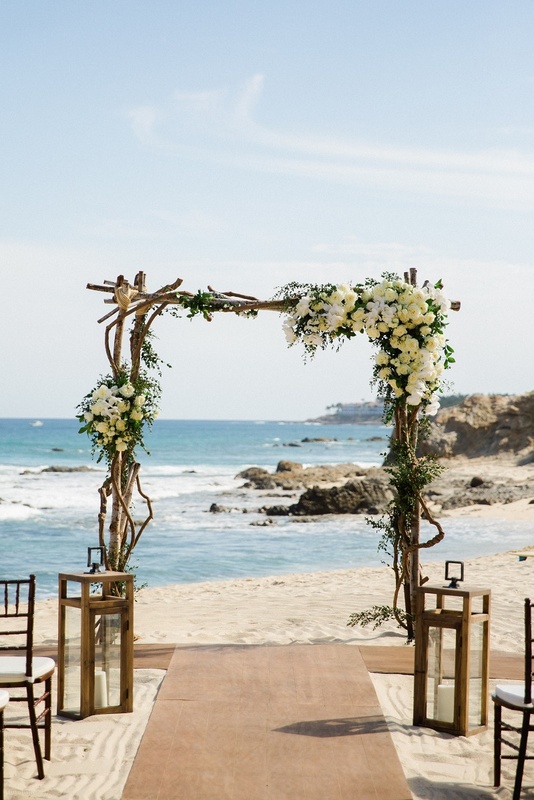 Love this set up and location of this wedding. 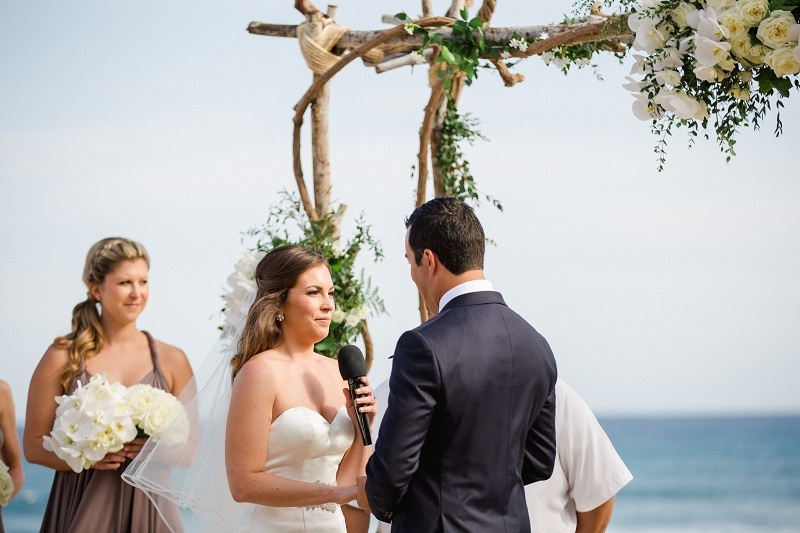 Was wondering if you could give me a rough price range on ceremony and reception for this area.